If you are suffering from occupational or respiratory illness and are searching for New Jersey workplace toxic exposure lawyers with a track record of success, call the law offices of Martin Kane Kuper, LLC immediately. Martin Kane Kuper is based in Middlesex County and specializes in personal injury and illness caused by an employer or manufacturer’s lack of regard for safety. We have secured multi-million dollar settlements for our clients, and we handle compensation cases throughout the state of New Jersey. State law requires industrial firms and contractors to follow a set of standards for safety. An employer or contractor can be found at fault for forcing workers into toxic situations or willfully disregarding OSHA regulations. In most cases, construction workers only receive compensation for illnesses resulting from toxic exposure, but negligence on the part of an employer or contractor can be grounds for a liability lawsuit. New Jersey workplace toxic exposure lawyers must be aware of the statutes and instances where an injured or sick employee can bring a lawsuit against an employer, outside of worker’s compensation courts. If it is demonstrable that an employer or contractor was guilty of known safety violations, and those conditions created a toxic exposure hazard, the injured employee may be entitled to a civil action. 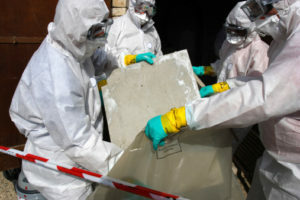 At Martin Kane Kuper, our professional team will work immediately to preserve the evidence at the scene and identify the cause of the toxic exposure. We will ensure that you are receiving just worker’s compensation, personal injury settlement and compensation for pain and suffering, as we have done for many of our clients in all types of personal injury cases. Don’t wait for guilty parties to bury evidence. Contact Martin Kane Kuper now and speak to our New Jersey workplace toxic exposure lawyers for a free consultation about your situation. We’ll work with you to help you make an informed decision to pursue the case. If you do, we’ll help you win the compensation you deserve.